A man in full armour was unrecognisable so each man wore a distinctive coat, by which he could be recognised, over his armour. This was called his coat "of arms". As no two men in the same region could wear exactly the same coat of arms, these "arms" were soon used separately as personal symbols -- and especially to mark their owners' possessions, because few people could read in those days. The Hundred Years' War was a series of conflicts waged from 1337 to 1453. Each side drew many allies into the war. It was one of the most notable conflicts of the Middle Ages. The second son gets a crescent, the third a mullet, the fourth a martlet, the fifth an annulet, the sixth gets the fleur-de-lys, the seventh a rose, the eighth a cross moline and finally a ninth son gets a double quatrefoil. Strict laws in applying for a new coat of arms were introduced. Each new coat of arms had to be registered with the government. A coat of arms belonged to the family of the knight. He would pass the coat of arms down to his eldest son. At Yesteryears we provide historical and heraldic gifts, such as Coats of Arms and Surname Histories, as part of a product range designed to last a lifetime. Products include Coats of Arms & Surname Histories and other exclusive prints and scrolls, along with crystal and glass gifts, shields & wall plaques, Heraldic maps, fine jewellery and timepieces, and an extensive range of other presents, all adorned with your chosen Coat of Arms. These unique and personalised products are not available on the high street, and make that perfect gift for anyone with an interest in their Coat of Arms or Family Name History. All products are quality keepsakes that appeal to people of all ages to display with pride and pass onto future generations. 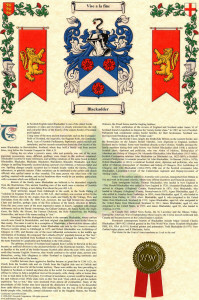 If it’s listed, please visit our online shop and choose a Coat of Arms & Surname History scroll, and/ or any other of our fantastic, unique and personalised gifts. Any queries you may have, or for any further information, please phone +44 7999426987, or email us at info@yesteryearsbrixham.co.uk. This is Yesteryear’s most popular product – a full colour rendition of your Coat of Arms, together with your authentic surname history at the bottom of the scroll. Beautiful border graphics complement the Coat of Arms. Each Scroll is printed on a sheet of A3 parchment paper, with an individual certificate number and a gold seal guaranteeing the authenticity. A bibliography detailing where we find out the information is printed on the back and is a great place to start if you are looking to research your name in any more depth. Choose from – scroll only @£19.50, or the framed option for £33.50. 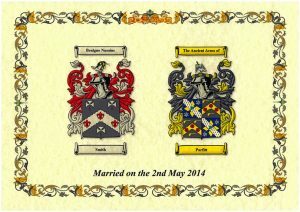 Printed on a sheet of A3 parchment paper, featuring two Coats of Arms side by side – the Anniversary Double is an exciting personalised gift option, perfect for weddings and anniversaries. graphics enhance the Coats of Arms on the Anniversary Scroll’. Choose from – scroll only @£24.50, or the framed option for £39.50. Heraldry is the art and science of designing and using a coat of arms. The study of coats of arms is also called armory. The practice of using distinct markings on a person’s shield started in the Middle Ages, when a knight’s helmet covered his face, making everybody look the same in battle. At first, only knights and nobility had coats of arms, but in the Middle Ages, some cities started using heraldry too. By the end of the Middle Ages, other people began using coats of arms, now called burgher arms, which means they belong to a regular person and not a member of the nobility. An official in charge of approving and recording coats of arms is called a herald.